The traditional boundaries for Dinétah are marked by four mountains: Hesperus Peak to the north, Mount Taylor to the south, Blanca Peak to the east, and the San Francisco Peaks to the west. The heart of the region includes Blanco, Largo, Carrizo and Gobernador Canyons east of Farmington, NM. Within the four sacred mountain boundaries are three more sacred mountains important to Navajo culture: Huerfano Mesa, Gobernador Knob, and Navajo Mountain. 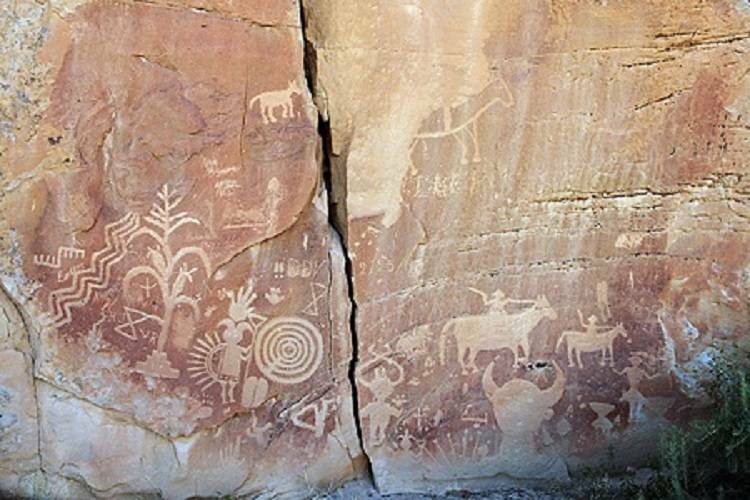 The earliest rock art found in the region was carved by the Ancestral Puebloan people, the same people who built Aztec Ruins, Salmon Ruins, and the ruins at Chaco Canyon, and Mesa Verde. Most of the other rock art is Navajo. Images of animals, humans, supernatural beings, plants, geometric figures, and weapons are carved or painted on the canyon walls. Most of the images are grouped into “panels” and are believed to be ceremonial in nature as many of the images found on the canyon walls are also found in Navajo ceremonial sand paintings. Crow Canyon is an excellent example of Navajo rock art. Later rock art consists of early Spanish settlers and explorers who left their names and sometimes the dates on the rock walls, often next to the Navajo rock art, or on top of them. There are more than 200 known pueblitos found in the core region of the Dinétah that were built between 1680 and 1775. They range from one-room structures to larger sites that include hogans, trash mounds, hearths, sweat lodges and rock art panels near a pueblito. The pueblitos themselves vary in size, from one room to over 40 rooms, built from sandstone slabs and mud mortar. Most are built to be defensive sites, with low doors and small windows, accessible by ladder or hand-and-toe holds and built on isolated boulders or pinnacles. Some of the larger and more accessible pueblitos have undergone stabilization by the BLM to preserve the structures. Google Earth Map of the Dinétah region. The sites are hundreds of years old. They are fragile and irreplaceable and your help is needed to preserve them for future generations to enjoy. Do not climb on the walls or roofs of the pueblitos. Do not remove artifacts from the sites. You may examine them, but leave them where you found them. Removal of artifacts is punishable by law. Do not touch the rock art panels. The acids on your skin can damage them. Maps and directions are for information only and are provided "as is" without warranty or any representation of accuracy, or timeliness of completeness. Pack a lunch and bring lots of water. Check the weather before heading out. Roads may become impassable when wet. Do not cross washes when water is present. The roads used to access the sites are oil & gas field roads. Be aware of large trucks and keep to the right of the road on hills and blind corners. Cell phone service is erratic in some areas. Visit these sites at your own risk.